This is a fantastic book on the parallels between today’s society in America and that of Nazi Germany. The author takes a chilling look into the similarities between the life, culture, politics, and mindset of the populace in Nazi Germany and how we are seeing history begin to repeat itself (as it often does) today. Hitler’s cronies seldom said they were going to kill people; even when plans were made to exterminate millions, the leaders spoke only in abstract slogans such as “the final solution.” Sanitized terms were used to camouflage unspeakable crimes. Planned massacres were spoken of in clinical terms to mislead the naïve and to assuage the conscience of the perpetrators. We do the same, of course. No one speaks of killing preborn infants. Rather, pregnant women are only removing “a product of conception” or a woman is simply “terminating a pregnancy.” Politicians speak of being in favor of “a woman’s right to choose . . .” but they seldom complete the sentence. Somehow to say they are in favor of a woman’s right to choose to kill her preborn infant, is too honest, too clear—we might add, and too chilling. Homosexual behavior turns out to be nothing more than “an alternate lifestyle.” And adultery is reduced to the more innocuous word: affair. Schools that demean religion and promote immorality are said to be “value free” and laws which deny religious speech are promoted as “the fairness doctrine” or simply promoting “localism.” Historically, horrendous crimes have been committed in the name of liberty. After reading this book (and previously posting a quote from it), I was informed that the author holds to the idea of easy believeism. I did not see this presented in the book as the author dealt mostly with how history is repeating itself in politics and culture, so the book is safe for consumption in that regard. This entry was posted in Abortion, Recommended Books and tagged Abortion, Bible, Blog, Book Review, Books, christian, Christianity, Erwin Lutzer, Faith, God, Hitler, Jesus, Nazi, Pro-Abortion, Pro-Choice, Pro-Life, prochoice, Prolife, Religion. Bookmark the permalink. A very effecient machine all run ontime by an IBM keypunch machine, or really thousands of them. So good in fact that they could track Jews to 1/16th Jew through data mining! Any idea where the book is available to buy, other than Amazon? 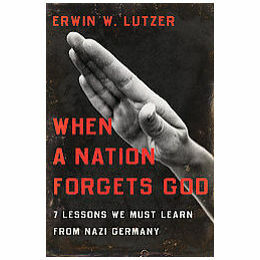 http://ebookee.org/When-a-Nation-Forgets-God-7-Lessons-We-Must-Learn-from-Nazi-Germany_1236664.html — Looks like you can download it for free at this site given above. I ended up purchasing about a dozen more to pass to people. It is an excellent, thought-provoking book which should be heeded. Great book as it is a real eye-opener to be alert to what is going on around!